Just two days after the First Day of Autumn, the Harvest Moon was the 'co-star' of the show at the Harvest Moon Fab Feast 'Dinner at The Farm', hosted by Anita, Teak and Kaitlan Nichols in the beautiful gardens of Mom's Pie House in Wynola, as a benefit for the Volcan Mountain Foundation (VMF). Nostalgic singer/songwriter, Gregory Page was the other star of the evening. He enchanted guests with his delightful melodies reminiscent of the 1920's jazz era and beyond. It was an evening of pure enjoyment! VMF is appreciative of the Nichols family, and for their many family and friends that helped throughout the day and evening. Thank yous from VMF and the Nichols family go out to Mr. Page, Suzy Johnson, Mark and Toni Marquette, Cynthia Merino, Poppi Poppe, Sally Snipes, Tyler Stamets, and Ken Wright and Carol Schloo-Wright for lending their expertise and helping hands. 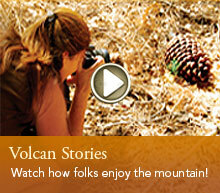 As Anita added, "These are friends of Volcan Mountain who have supported VMF fundraising for many years." She also expressed her thanks to the gracious guests who shared the evening and also supported the fundraising effort. We had a terrific turnout for the Sustaining Friends Fall Visioning Day on the first Sunday of October with a presentation from Jane Santorumn of the Julian Mountain Lion Project, a vigorous exchange of ideas, and a delicious lunch donated by Michel Malecot of The French Gourmet. It was followed by a special guided hike along a new trail through the recovering landscape at the Hubbell's Ilan-Lael Art Center. 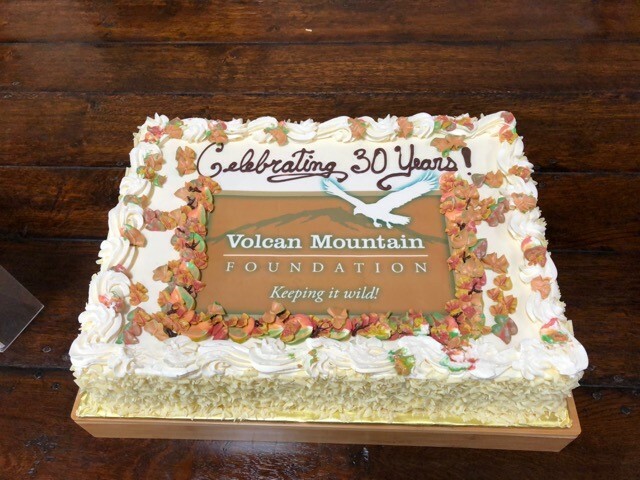 Then on Saturday, October 13th, the Volcan Mountain Foundation celebrated its 30th anniversary with a special gathering at Michael and Meili Pinto's retreat center on the east side of Volcan Mountain along the San Felipe Valley. In honor of the occasion, an original composition was commissioned by the Volcan Mountain Foundation with a special award from the Marjorie and Joseph Rubenson Endowment for Art and Science at Volcan Mountain. Noted San Diego-based pianist, composer and educator, Nicolas Reveles was commissioned for the composition. The Volcan Mountain Suite for clarinet and piano was composed in the summer of 2018 after a visit to Volcan Mountain in the late spring earlier in the year. The piece is not only a reflection of the diverse native flora on the mountain, but of the composer's longtime passion for California native plants. It consists of seven short movements, each inspired by a different species in the particular plant community. Mr. Reveles and clarinetist, Peter Dayeh captivated guests with their moving performance of the composition's debut. Guests were also treated to a preview of art from 2018 Rubenson Endowment artists, Angela Berry and Shaun O'Dell, and Sally Snipes. The Volcan Mountain Foundation wishes to thank the musicians and artists for sharing their gifts, Michael and Meili Pinto, Peter and Vicki Bergstrom, and David and Kathleen Rubenson for hosting and sponsoring the event--and many, many others for organizing and coordinating. The Rubensons commented that they could feel Marge's (Dave's mom) presence in the room. Dave added, "This is just the type of gathering that Mom had envisioned happening (through the family endowment)!" Check out the short 'preview' video of the event created by Creative Flow Media. A longer video of The Volcan Mountain Suite debut is still to come. There are still more fall events to come! Go to VolcanMt.org to register for the 2018 Rubenson Endowment Artists' Receptions on Sunday, December 2nd. Tickets for the event at the Ilan-Lael Art Center are limited. There are also still spaces available for Wildcrafting: Acorn Holiday Cookies on Sunday, November 18th--a fun way to kick off the holiday season!